Viviane's Cleaning & Restoration Inc Removes Water - Quick! Viviane's Cleaning & Restoration Inc always has an emergency water removal team standing by. We know that time is of the essence when it comes to a water emergency. Whether from a flood or an appliance leak, the result is the same. 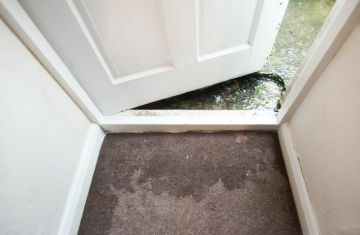 Water leaking into walls and floors is devastating. When this happens, every hour counts. Call Viviane's Cleaning & Restoration Inc for a quick response from an experienced crew of water removal experts who will assess the situation and quickly devise a plan to remove the water from your building. Speak with a Water Removal Technician now! Assessment: We'll determine the type of water damage present and develop a plan of action. Information: You will be informed of the damages and receive a written estimate. Extraction: Viviane's Cleaning & Restoration Inc will remove all water present and begin the restoration process. Drying: State of the art air movers other necessary heavy duty equipment dries all surfaces. Sanitize: Contaminated surfaces are sanitized to remove toxins and odors are neutralized. Viviane's Cleaning & Restoration Inc is a local favorite for house cleaning services, and we also offer emergency water extraction when problems occur. The benefit of calling Viviane's Cleaning & Restoration Inc at 781-222-3182 for water removal is that you can be assured that all necessary cleaning and sanitization will also take place, which is essential for flood waters. We even handle water removal from toilet overflows and other instances where raw sewage is involved.